Wayne’s last entry in his journal was on Wednesday after a mission to Ambon Town. Today he writes . . .
A couple of days of rest. Were alerted the 26th and 27th for possible contact with the Japanese home fleet which is evidently fleeing from ours after a terrific whipping.1 These two days, I believe, have been the turning point in the war with Japan. Their complete defeat is inevitable. The question is when. Sooner than we think, I believe. Sometime in the coming year. Hope to live to see that day. 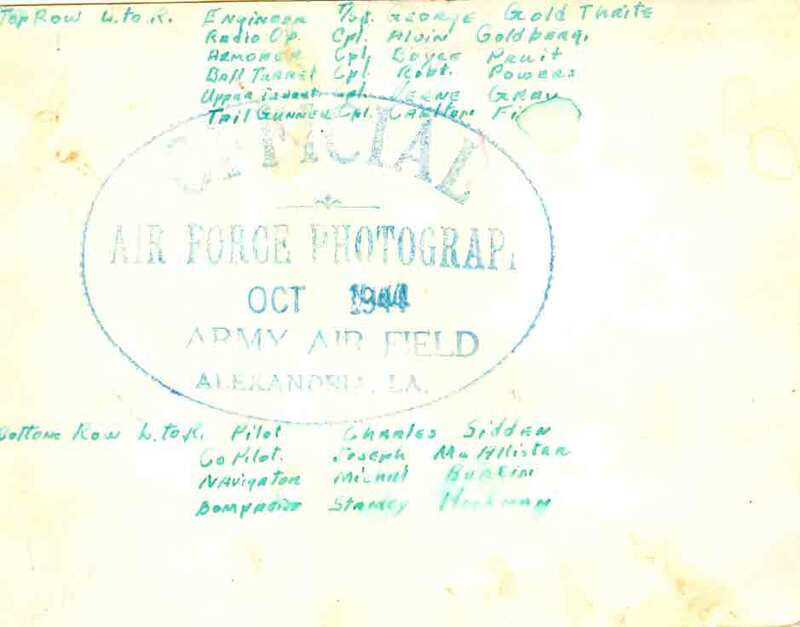 This photograph was taken near Crew 7678’s graduation date from the training school at Alexandria Army Air Base. Verne’s wife and son left Alexandria, Louisiana sometime before October 27. The envelope for the following letter was addressed to her at her parent’s home in Colorado. All’s well honey but this train ride is getting sort of monotonous. We left the field at 11 a.m. and started traveling at 12 p.m. Things are moving right along. We been underway six hours and have traveled 120 miles or up to Shreveport. The rate we are going we shall be in Lincoln by the end of the year at least. Our car is a regular cattle car4 this time. The beds are at least long enough so my feet won’t hang over the end so that is some compensation for the rough riding. Up to now the engineer seems to be trying to break our necks the way he is continuing to jerk the train. Say, baby, if you have a chance to get a Redbook magazine for October you should read the stories “My Love Comes Home”5 and also “It Was a Wife He Wanted”6. I’ve read both stories today and they impress me quite a bit. Please read them and let me know what you think of them. They say we will only have a few hours off at Lincoln so I guess it’s no use trying to see you up there. Nothing is definite yet so I guess there’s no use surmising about it until we actually arrive there and see things for ourselves. Things seem to move along faster than ever carrying me closer and yet further away from my loved ones every second that passes. Gee, Honey, it scares me to think that soon I shall be many, many miles away from you and Al. Take care of my baby as best as you can darling. He is a little bit of me and in him rest my prayers and dreams. Try your best to help him throughout his life dearest. He will depend upon you as I do and will love you as I do. 1 The “terrific whipping” to which Wayne referred was the Battle of Leyte Gulf. This was the largest naval battle of World War II and perhaps the largest naval battle in history. It was fought in waters near the Philippine islands of Leyte, Samar and Luzon from 23–26 October 1944, between combined U.S. and Australian forces and the Imperial Japanese Navy. On 20 October, United States troops invaded the island of Leyte as part of a strategy aimed at isolating Japan from the countries it had occupied in Southeast Asia, and in particular depriving its forces and industry of vital oil supplies. The Imperial Japanese Navy (IJN) mobilized nearly all of its remaining major naval vessels in an attempt to defeat the Allied invasion, but was repulsed by the U.S. Navy’s 3rd and 7th Fleets. The IJN failed to achieve its objective, suffered very heavy losses, and never afterwards sailed to battle in comparable force. The majority of its surviving heavy ships, deprived of fuel, remained in their bases for the rest of the Pacific War. — Four other American ships and HMAS Australia were damaged. — One Fleet Aircraft Carrier: Zuikaku (flagship of the decoy Northern Forces). — Three Light Aircraft Carriers: Zuihō, Chiyoda, and Chitose. — Three Battleships: Musashi (former flagship of the Japanese Combined Fleet), Yamashiro (flagship of the Southern Force) and Fusō. — Six Heavy Cruisers: Atago (flagship of the Center Force), Maya, Suzuya, Chokai, Chikuma, and Mogami. — Four Light Cruisers: Noshiro, Abukuma, Tama, and Kinu. — Nine Destroyers: Nowaki, Hayashimo, Yamagumo, Asagumo, Michishio, Akizuki, Hatsuzuki, Wakaba, and Uranami. Listed Japanese losses include only those ships sunk in the battle. After the nominal end of the battle, several damaged ships were faced with the option of either making their way to Singapore which was close to Japan’s oil supplies but could not undertake comprehensive repairs, or making their way back to Japan where there were better repair facilities but scant oil. Cruiser Kumano and battleship Kongo were sunk retreating to Japan. Cruisers Takao and Myoko were stranded, unrepairable, in Singapore. Many of the other survivors of the battle were bombed and sunk at anchor in Japan, unable to move without fuel. Participating in the Battle of Leyte Gulf were six U.S. Navy battleships: West Virginia, Maryland, Tennessee, California, Pennsylvania and Mississippi. All but the Mississippi had been sunk or damaged during the attack on Pearl Harbor. They had been refloated, repaired and placed back in service in time to engage the Imperial Japanese Navy during the Battle of Leyte Gulf. “Battle of Leyte Gulf.” Wikipedia. (http://en.wikipedia.org/wiki/Battle_of_Leyte_Gulf : accessed 18 October 2014). 2 Gunners Flying Training Report. 24 October 1944. Combat Crew 7678, 221st Combat Crew Training Unit, Alexandria, Louisiana. Cpl. Boyce L. Pruitt. Cpl. 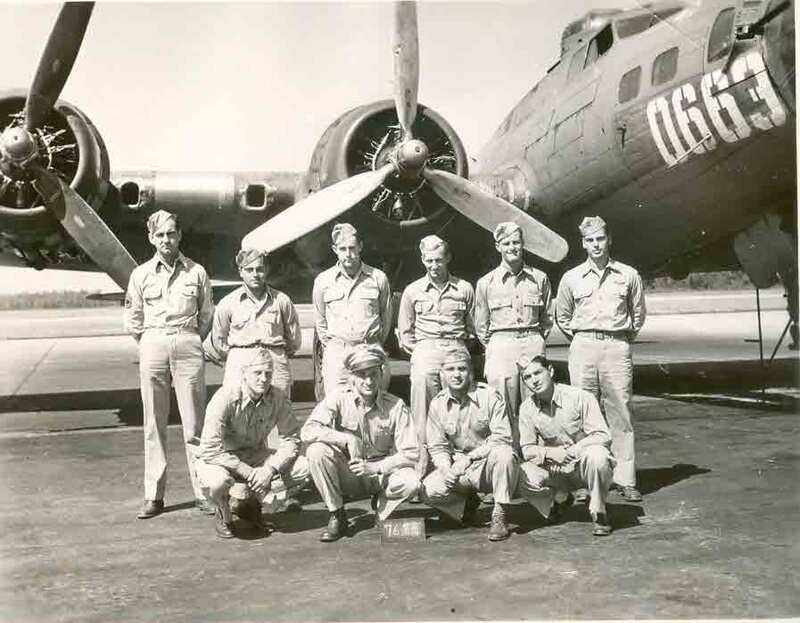 Pruitt and Verne R. Gray were both members of Combat Crew 7678. 3 This letter, written on October 27 while in route to Shreveport, Louisiana was postmarked October 30 at Lincoln, Nebraska when Verne and his combat crew arrived. 4 “Our car is a regular cattle car . . .”, figuratively speaking; not literally. 5 Lawrence Williams, “My Love Came Home”, Redbook October 1944. 6 “It Was a Wife He Wanted”, Rosamond du Jardin, see: Guide to the Rosamond du Jardin Papers, 11930-1960 (http://nwda.orbiscascade.org/ark:/80444/xv75415 : accessed 07 October 2014). This entry was posted in Uncategorized and tagged 221st Combat Crew Training School, Abukuma, Akizuki, Alvin Goldberg, Asagumo, Atago, Boyce L. Pruitt, California, Carlton D. Fisher, Charles W. Sidden, Chikuma, Chiyoda, Chokai, Combat Crew 7678, Fusō, Gambier Bay, George William Gouldthrite, Hatsuzuki, Hayashimo, HMAS Australia, Hoel, Johnston, Joseph M. McAllister, kamikaze, Kinu, Kumanok Kongo, Leyte, Lincoln Nebraska, Luzon, Maryland, Maya, Michael J. Burcin, Michishio, Mississippi, Mogami, Musashi, Myoko, Noshiro, Nowaki, Pearl Harbor, Pennsylvania, Philippines, Princeton, Redbook magazine, Robert F. Powers, Samar, Samuel B. Roberts, Singapore, St. Lo, Stanley Bookman, Suzuya, Takao, Tama, Tennessee, train, Uranami, Verne Richard Gray, Wakaba, West Virginia, Yamagumo, Yamashiro, Zuihō, Zuikaku. Bookmark the permalink. I’m looking forward to reblogging some of Wayne’s eye witness accounts in the Pacific when I reach that time. I’m I reading more into Verne’s letter? The end sounds very ominous to me; as though he expects not to return? While I defer to your expertise as well as Mustang’s, the “whipping” may have been more complete if the intelligence that had been collected been appreciated by MacArthur and Nimitz. The advice submitted by Nimitz’s intelligence officer, Capt. Mike Cheek was pushed to the side prior to the battle. Further, I understand the information that was contained within Plan Z was initially hogged by MacArthur being marked “Top Secret”. I am not qualified to discuss the issues you raise in your comment. I wasn’t there. Further, I suspect that the original source documents upon which such opinions might be based still remain classified. When I read the assertions of those who write with after the fact certainty about those events in which they did not participate, the Biblical phrase “For now we see through a glass, darkly” always comes to mind. (1 Corinthians 13). Then there is always the concept of the fog of war, as introduced by Carl von Clausewitz: “War is an area of uncertainty; three quarters of the things on which all action in War is based are lying in a fog of uncertainty to a greater or lesser extent.” (http://en.wikipedia.org/wiki/Fog_of_war).